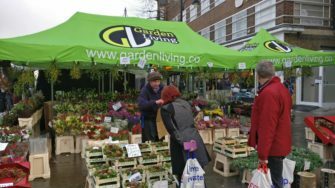 Market stall holder selling plants and flowers. Right at the western end of the market is a chap called Billy Charles selling flowers. He certainly has got lots of charm, and plenty of double entendres, which I overheard when I went to tell him what I was up to and to ask him what his name was. He only uses these when he’s speaking directly to a customer, usually a lady I observed, and on this recording you can only hear his less personal, loud banter for attracting the customers from far and wide. Interesting note: On Google satellite view you can actually see Romford Market on a market day!